Don’t let your kids see this. Never mind that, don’t let yourself see this. Disturbing, bad movie. Magical. Fun. Liked it a lot and TWO THUMBS UP!!!!! Love the cast. The story line had a bit much going on but was still very good. Probably great for older kids, my kids 6 and 7 were scared sometimes and there is a lot of witchcraft, demons, blood magic etc in which was a little uncomfortable, but I should have researched the movie more. Nothing about the devil. Gezzzz. This was a funny movie. WAY too much going on to hold interest - and at times seems mean spirited - I would NOT take young children to see this one. Hail Satan! Bring your kids!! I liked this movie in a weird scary kind of way. Good entertainment. The kids liked it. The child actor did the best acting. Loved it, anything with magic in it appeals to many. Jack Black is always worth seeing! Really fun watch if you don't take things too terribly seriously. It looks like they had fun making it. Couldn’t wait for it to be over! Boring with few laughs. Very disturbing satanic movie. I wouldn't take my children to see this. Waste of time and money. No effective comic relief. Worst movie I have seen in a while. The acting was fine, but the story line is really DUMB. This is more of a “humorous” movie as opposed to a comedy. 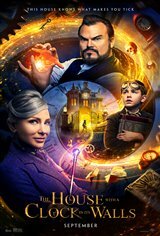 Jack Black & Cate Blanchett deliver a decent performance for a light movie. While the movie is somewhat predictable, it’s all in good fun. The house itself also puts in a good performance! I gave it 4 stars because I enjoyed the movie and it had enough ridiculous moments that it will be worth watching again. This movie is demonic and satanic. I enjoyed this ,,,easy watching bit of fun..not better then Potter films,but well worth seeing! Bored me to death--left after 45 minutes. When Jack Black is bad, he's really bad...……….gurubob…….two thumbs WAY down. The film doesn't seem to know what it is about-is it trying to make you laugh, take it as a fantasy? as a real story? scare you or to be a farce. One moment it is trying to do one of these things and then it moves to contradict this point. With that said-for an audience of between 6 to 13 this film will be a solid 4 stars but for any adult this film is painful to watch like a very bad version of Harry Potter (which I loved). About the only thing that saves the film at all are the interesting set designs inside the house that are not the fake looking CGI effects in the film. If you have kids you should take them but if you are an adult skip this one as this not a film of the quality of the Harry Potter films. Films like this ultimately fail as the film makers seem to forget that in order to take someone into a flight of fantasy suspension of disbelief must occur-this never comes close to happening anywhere in the film. Excellent effects and terrific acting. Amusing side characters. Creepy story with right amount of humor. Really draws the viewer in. Good for older children and adults as well. If the last Harry Potter films were as good as this they'd still be making them. Ummm, not for me. Perfect for the younger crowd. Technically good but not for me. A must for Potter fans. Well acted, perfect amount of humor, Halloween scared, colorful, friendship lesson, and special effects. Much better than The Predator. What a cast! Got up and watched Predator instead..That was at least better than this one. The acting was good though. An exciting and magical story perfect for the Halloween season. Too dark and scary for small children. The academy award for fiction goes to all the fake reviews for using the word awesome. Perhaps the administrators of this site should no longer run reviews as most of them are nonsense at best, misleading people into wasting their time and money. To those who believe the reviews, time to wake up. P.s. the movie is barely worth renting. Wait for Netflix when it is free. I'm not sure why people liked this movie so much. Poor Script with good actors. I couldn't wait to get out of this one.